Created in 1995 by Solara in Finland. Purpose: To integrate the Earth & Star elements within our own beings. The Earth-Star Dance symbolizes the Sacred Union between Earth & Star which takes place within the core of our beings. Each of us is composed of both Earth Being and Star Being. When we can fully express our merged polarities, we are ready to unite into even greater conscious Oneness. The powerful Earth-Star Dance enables us to do that. Be prepared to be uninhibited, to look weird, to throw yourself into this wondrous dance as you activate parts of yourself you haven’t felt before. All your movements should be emphatic, almost exaggerated, while you bring alive the energies of Earth & Star. The more you EMBODY these primal energies, the more you will be transformed. Before you begin this dance, choose a partner. Take a good look at the feet of your partner because this is how you will find them later on in the dance. Music for the EARTH-STAR DANCE: Now available by Download. The music begins with the deep, pulsating rhythm of the primordial Earth Beings who live beneath the surface of the planet. We dance by ourselves with a heavy, stomping motion, first with one foot, then with the other, low to the ground with knees bent. Earth Beings feel the heavy weight of gravity and ALWAYS look only at the ground. With each step, the Earth Being merges deeper into the Earth; stepping heavily, breathing heavily, they are of the Earth. The Earth Beings make low, grunting noises or growls while they dance. Their hands are curled up in fists or paws. Remember: Earth Beings only look downwards! Soon, the music changes to the lighter rhythm of the Star Beings who rotate gracefully with arms uplifted to the sky, eyes ALWAYS looking upwards, with an expression of unbridled joy and ecstasy. They are light as a feather, elongated, barely touching the ground. When the music changes, we all become Star Beings. The Star Beings make sounds of bliss, delicate songs of lightness. Each time the music changes, all the dancers shift between embodying Earth Beings or Star Beings. After about 5 minutes, there will be a noticeable change in the music as a flute-like (or is it bells?) sound is introduced. This signifies that it is now time to find your partner. 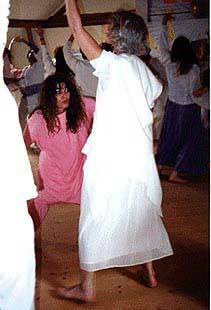 (During Phase One and Two, you should stay fairly close to each other & recognize each other by your feet while you dance as Earth & Star Beings.) You join your partner by taking hold of each other’s left forearm. You will grasp their arm right below the elbow. Earth Beings will hold onto their partner with a heavy grip while Star Beings will hold on very lightly. ONE OF YOU WILL NOW BE AN EARTH BEING AND THE OTHER WILL BE A STAR BEING. (This means that one of you will be dancing to the appropriate music, and the other will not.) You need to choose this either beforehand or in an instant. And don’t forget to make the sounds of the Earth & Star Beings while you dance. It is VERY IMPORTANT that you NEVER look at your partner during this phase of the dance. Each time the music changes, the partners will switch positions, letting go of their partner’s forearm and changing arms. The Earth Being rises up and effortlessly becomes a Star Being while the Star Being will slowly sink downwards and become an Earth Being. After a further 7 minutes or so—which will seem like an eternity if you are putting everything you have into this dance—the music will change yet again, opening up and becoming quite celestial. As soon as the music begins to change, we stop dancing and remain in position as either Earth or Star. VERY SLOWLY we let go of our partner’s forearm and the Earth Beings go deeper into the Earth while the Star Beings rise higher into the sky. IT’S VERY IMPORTANT TO TAKE YOUR TIME DURING THIS PART AND REALLY FEEL IT! You can take ten minutes for this phase of the dance if you like. Then the Earth & Star Beings begin to feel their first impulse of massive change. A deep yearning washes through you, calling the Earth Beings to rise upwards into the Unknown. At the same time, the Star Beings feel something pulling them downwards to a place where they have never been before. Very slowly, the Earth Beings begin their journey upward towards the stars while the Star Beings feel the urge to descend into matter. Ever so gradually, you are being drawn into the Unknown. After awhile, you become aware that you are not alone, sensing the physical presence of another being so very different from you. This is an amazing revelation. PLEASE TAKE YOUR TIME, as a major transformation is taking place in the core of your Being. This experience will be as deep as you allow it to be. Until this moment, neither of you was aware of the existence of the other. You are amazed that such an incredible being could ever exist. This is the strangest being you have ever seen. The first contact between you can be a light touch or a fleeting glance. The first eye contact will often feel excruciating, so let it happen slowly and gently. A fear of the Unknown soon gives way to a sense of wonder as you open up more and more to your partner. You are merging Earth & Star into full Sacred Union, until you finally become One Unified Earth-Star Being. The now complete Earth-Star Beings raise their arms into the One Heart position and slowly dance from side to side as One. (You can step to the left with your left foot, then bring the right foot closer to the left foot. Next, you can step to the right with the right foot, then bring the left foot closer to the right foot. And keep on repeating these steps.) Your upraised hands are slightly apart with fingers aligned, but not touching. THE KEY IS TO BE DELICATE AND SUBTLE, serenely rejoicing in the feeling of sublime Sacred Union. The partners now gently dance away from one another, going backwards and thereby expanding their Oneness, feeling their One Heart as a great pool of shared Essence. PLEASE AVOID STRONG EYE CONTACT at this time as it will only weaken the energy of the One Heart. Concentrate on the pool of your One Heart. It is now time to randomly change partners, aligning as One Being with whomever you encounter until you all become One Vast Earth-Star Being. Once this is achieved, we can move freely amongst each other in the One Heart position, softly splashing love over one another. 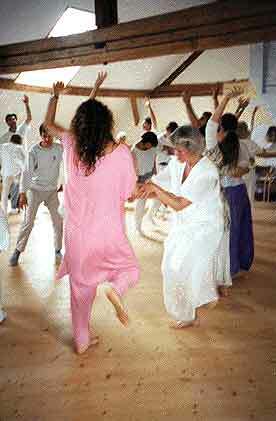 The Earth-Star Dance takes about thirty minutes and should be danced twice whenever possible. If you wish, you can begin the dance at Phase Three when the partners come together. Choose the same partner and make sure that you start Phase Three as the opposite being to the one in which you completed the first dance. (For example, if you finished the previous dance as an Earth Being, you would now begin Phase Three as a Star Being.) This lets you experience both of your polarities.